Of course, there were days that we decided to put the kitchen into use. Normally, it was to impress someone special. Or sometimes, it was simply because we didn’t bother to go out, preferred to be in our PJs for the whole day. But the best occasion was when friends came over and fed us! On one of such “best occasions”, I learned how to make these particular pan-fried dumplings from a Beijing girl, whose name I forgot (she was dating a friend of a friend, you know the normal story). The dough consists of only water and flour. Fillings? The usual suspects - meat, vegs and seasoning. The better Chinese cooks, according to that Beijing girl, would know how to pleat the dumplings properly. But hey, we were spoiled young girls who hardly knew any cooking skills. So no pleating for us (and the dumplings looked more like a pie than anything). After all, pretty food was only a bonus feature of a tasty meal. I still make this kind of dumpling to this day. Lately, however, I have experimented with the dough a little by changing the flour ingredients. With the memory of my grandmother’s fried sticky rice “cake” (banh ran man) in mind, I opt to use a bit of glutinous rice in the dough. And to make the “skin” a bit lighter, a tiny bit of yeast is added. I like this version no less than the original one. 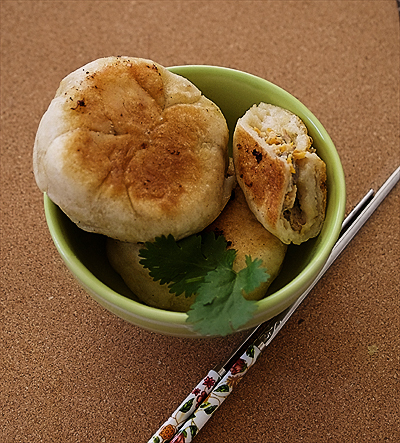 The final product is the cross between pan-fried dumplings and soft mochi bread. It is crispy outside, and soft-chewy at the same time. It’s also relatively easy to make, too. I’m thinking of substitute white flour with whole-wheat flour while keeping the glutinous rice four. Will it be a bit too westernised? 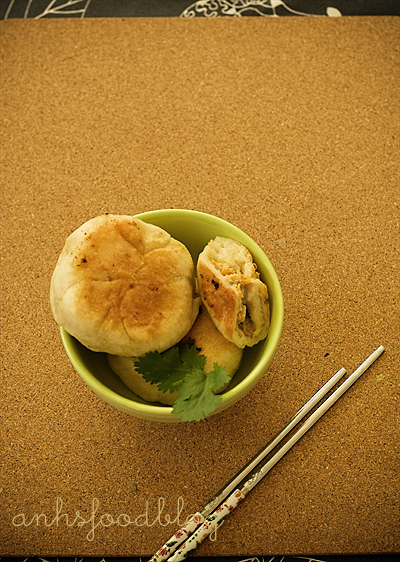 The dumplings (or bread/pies, whichever you choose to call them. 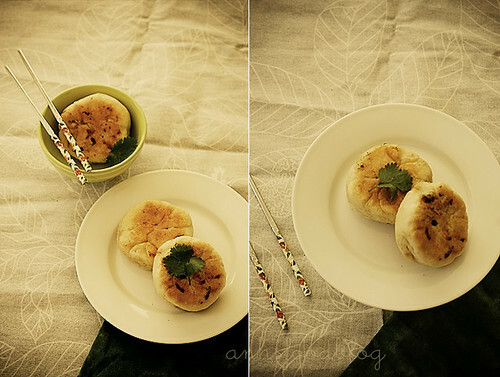 They are known as “the dumpling bun thing” in our house) are on the heavy and rustic side. Better served as snack or breakfast with a cup of hot tea. The dough recipe has been tested a few times so it’s good to use. As for the filling, I never follow a correct measurement. Lately, we have a vegetarian guest so I always do both meat and vegetarian versions. Use whatever you have! If you like meat: 150g chicken fillet, 1 small carrot (peeled and grated), a few frozen water chestnut (defrosted), 1 small spring onion, a few drop of toasted sesame oil. Oil to fry. Salt + soy sauce + white pepper to taste. Veg option: peas, corn, water chestnuts (defrosted). Soy sauce + pepper for seasoning. Prepare the dough first: combine the flours, salt together with yeast. Gradually add in the warm water. You have to watch and feel the dough here. Use enough water so the dough just comes together. Knead briefly (the dough is elastic because of glutinous flour). Put in an oiled bowl, cover with damp towel. Let it rest about 40’-60’. Meanwhile, prepare the filling: coarsely mince the chicken with water chestnut. Add in grated carrot, chopped spring onio, and seasoning. I like to stir-fry my fillings to get the seasoning right before wrapping. You can just marinade the meat mixture with seasoning and use it raw if preferred. Make sure your filling is cooled down before wrapping. 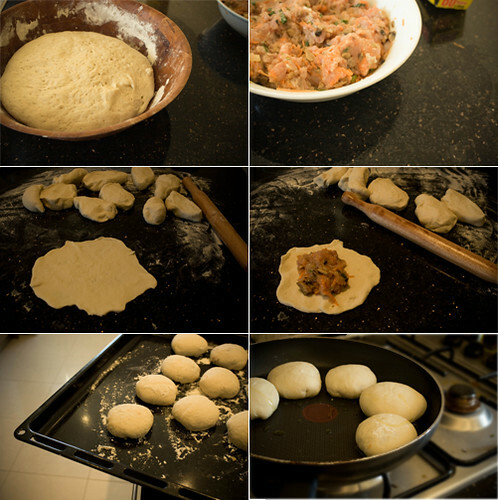 Wrapping: Divide the dough into 8-12 portions. Use a rolling pin, roll out the each piece of dough on a lightly floured surface. Make sure that the middle part is slightly thicker. Add in the filling, twist and put the seam side down. Repeat until you have finished the dough. Cover and set aside for 10 mins. Frying: Heat up a non-stick frying pan and heat up 1-2 tablespoons of oil. Make sure the oil is hot, put the dumplings into the pan. Immediately lower the heat, cover the pan, and cook gently until the dumpling skin is golden (around 8-10 mins each side) and cooked through. (Be mindful if your filling is not pre-cooked). Serve hot/warm with a dipping of chilli and soy sauce. Enjoy! This post is prepared for the IPP, hosted by a fellow Melbourne blog friend Penny of Jeroxie.